An internationally-renowned manufacturer is the latest flourishing company to pledge its future to the expanding Winsford Industrial Estate. 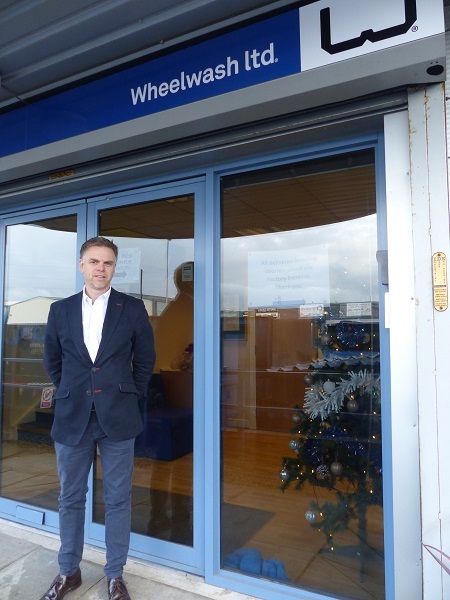 Wheelwash Ltd moved into its new base on Road Four on the estate in October after it outgrew its previous home. The Council’s Business Growth Team has helped the 30-year-old company find a larger base in west Cheshire where it can continue to grow and create jobs. Wheelwash Ltd builds, sells and rents systems which clean the dirt from large vehicles as they leave construction and landfill sites to prevent them from transferring dirt onto the highway. The system is placed at the exit of a site and vehicles drive over it. Water is sprayed onto the wheels and underneath, cleaning it in a matter of seconds. Its managing director Ian Jolly said: “Most drivers have experienced driving over muddy marks outside construction sites. We are trying to stop that dirt going out onto the highway from a, potentially, contaminated site. “We moved here in early Autumn 2018 and gradually completed substantial works to the site. Our previous site was in Crewe and we moved here because we needed a much larger fabrication area. We wanted a more permanent home so we moved in and invested £250,000 at the property. “The equipment we produce can be very difficult to handle so a large building is essential. Trying to find that in the region is difficult however this industrial estate has many of those facilities. The Council were helping us to look for property. We also looked at other locations on this estate. “The main reason for moving into this location is it’s about the long term nature of the business so we can look to expand into new areas and do more of the same. We work a considerable amount more now internationally and that should be good for the local economy. There is good access to the motorway and major A roads from here. With the equipment being large, most of it goes as an oversize load. The industrial estate offers that easy access. “We are recruiting five positions, right across the business to secure ourselves for the future, the majority of the positions we are offering are new roles. It is about getting the right skill set in the business. A lot of applications have been from the local area so that is quite critical. Being here secures that long term growth, securing more employment for the area and who knows where that will take us as a business. Up to 1,500 jobs could be created at the industrial estate after the Council’s partnership with Public Sector Plc resulted in planning approval for the expansion of Winsford Industrial Estate which consists of 56,900 square metres of industrial, commercial floorspace. There are also plans to support the area with a petrol station, a pub and a hotel. Tiger Trailers is another company which is expanding, creating new jobs and moving to a larger site on the industrial estate. Councillor Brian Clarke, Cabinet Member for Economic Development and Infrastructure, said: “Wheelwash Ltd is an expanding company and its decision to move to our borough and invest in the future of Winsford Industrial Estate is further recognition for the work the Council is putting into expanding and improving this employment area.